OctoPass™ is a new powerful password recovery system made for recovering forgotten or lost passwords using distributed computing. The current version supports brute force attack only. Who and Why Needs OctoPASS? Password Recovery is extremely resource-consuming task. If a password protection is well done, brute force attack may be the only recovery method available. If the password is long enough, it may take a lot of time to break it. By using the power of multiple computers, you can reduce the recovery time. OctoPASS first of all, targets security professionals and forensic examinators. Naturally, utilizing OctoPASS makes sense only when several computers are available. The more computers you have, the higher search speed and better results you obtain. Scalable architecture optimized for the best performance. OctoPass™ supports remote web-based management. Highly optimized recovery engines that support all major algorithms. OctoPASS Agents (worker) interacts with OctoPASS Server through the common HTTP protocol. OctoPASS Agents and OctoPASS Server could be installed in different LAN segments or even interact through a global WAN. Lightweight installation size, ease deployment. Special hardware support. We offer special versions for IBM Cell processor (available in Sony PlayStation 3) and GPU Password Recovery Engine for NVIDIA video cards. Password protection in the earlier versions of Access (prior to 2007) is weak; all passwords could be recovered instantly without brute force attack. Passwords to old MS Money files could be recovered instantly. It is possible to reset password on a Quickbooks document, so brute force attack is required only if only you need to find the original password. Currently we support the recovery of WinRAR passwords, only if file names in the archive are encrypted. Modification passwords, document protection passwords, workbook passwords, and all other passwords - except document access passwords - all these passwords are recoverable instantly, and OctoPASS is not required for handling them. Access passwords to the old Office (95 and earlier) documents - these passwords are also recoverable instantly. Access passwords to Office 97 - 2003 documents - these passwords are supported by OctoPASS; however, please keep in mind that you can take advantage of the Express Recovery service to recover these passwords quicker. Advanced encryption passwords available as an option in Office XP and 2003. By default, Office XP/2003 uses Office 97-compatible password protection mode; however, user can choose the "advanced options" and change the encryption settings. Express Recovery will not handle such documents. Office 2007/2010 passwords. These passwords are very hard to crack, so OctoPASS can be extremely useful in breaking such passwords. OctoPass Server is to be installed on a single computer, which would coordinate the recovery process. 3) Allows administering and managing the recovery process. OctoPass Agent is to be installed on all computers connected to the network. OctoPass Agent carries out the password recovery job utilizing the power of the computer it is installed on . Since OctoPASS Server consumes very little computing power, literally any computer can be used as the server. To utilize the computing power of the server, install OctoPASS Agent on it also. The components that immediately execute the password recovery algorithms. 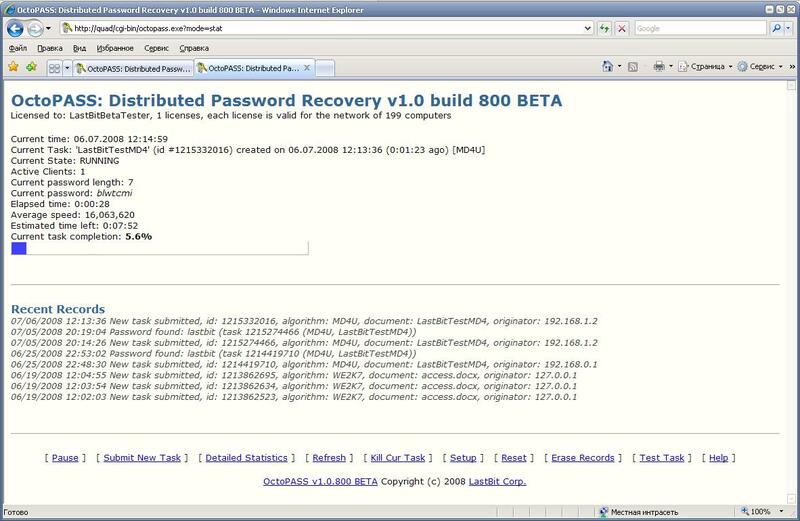 Password Recovery Software - the program that analyzes password-protected document , generates password recovery task and submits it to OctoPASS Server. The password recovery task contains user-selected parameters of the brute force attack (password length, character set, etc.) and DocumentData - the information extracted from the password-protected document, necessary and sufficient for the recovery of the password. In case of hash algorithms (MD4, MD5, SHA1), DocumentData contains the actual hash. With the purchase of the OctoPASS license, you will obtain the full versions of all of our password recovery programs. OctoPass Server is a CGI application running under on HTTP server. Please note that requests are always sent from agents to server; server never sends requests to agents. The network settings must provide that agents' HTTP requests are not blocked and able to reach server. To add a new computer to an OctoPASS network, simply install OctoPASS Agent on that computer; no other settings or configurations are necessary . OctoPASS Agent can be installed in the completely automatic silent mode; simply run a single application that doesn't require any configurations. This lightens the deployment of OctoPASS on a large number of computers . High-performance CPU is recommended. The faster CPU is, the better are the results. Multicore, multiCPU is a plus. Other PC components (RAM, HDD, ets) do not affect the performance. You can dramatically increase the search speed by using special hardware. Currently we provide software for NVIDIA GPUs (video cards) and IBM Cell processor (Sony PlayStation 3). You can find more information here. To take advantage of GPU Password Recovery Engine, please download GPU Password Recovery Engine from www.LastBit.com/gpu.asp and install it on each and every computer running OctoPASS Agent. OctoPASS Agent automatically uses GPU Password Recovery Engine if it is installed. To disable GPU Password Recovery Engine, simply uninstall it. If you are interested in the Cell processor version, please contact us for the further information. The free demo version of the software is available for the evaluation only. The demo mode doesn't have restrictions on the number of agents allowed to be in an OctoPASS network; however, the only algorithm supported by the demo version is MD4 (ASCII). No restrictions are imposed on password length . Each OctoPASS license purchased entitles user to install OctoPASS on one server. We offer several types of licenses , which differ by the number of agents supported in an OctoPASS network. You can find further information and place an order here. With the purchase of an OctoPASS license, you also obtain LastBit Software MegaPack - all our password recovery programs.